What would you make if you found an item that would let you quickly and easily produce a multimedia presentation? a private message to someone special? a supplement to that big term paper? There are some software titles that will do this ... sort of. PowerPoint and Flash are two that most will recognize, but they create PowerPoint and Flash files; you have to have the software to view them. Then there's the cost. And the learning curve. And cross-platform Mac/PC issues. You could put these creations on a website or a social media site, but you probably know that few people will regularly check your site for such things. And what if you're using such a site to get a job? It is entirely possible that the person reviewing your resume will have blocked access to much of the internet and would be unable to view your site if the decision to do so was even made. Would you really want a potential employer to see the personal aspects of your life posted on a social media page, assuming they go there at all? In today's increasingly competitive job market, there is an enormous need to stand out from the crowd and quickly grab attention. Digital resumes do just that. 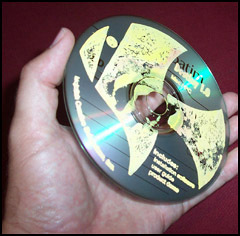 The best way to distribute your creations is via a business card sized CD. If you put something tangible in their hands they will be curious about it and will want to know what's on it. It can easily be mailed with a paper resume or handed out like a business card. The information and the overall impact delivered by a digital presentation is unmatched. As an addition to a traditional resume, a multimedia presentation will allow a potential employer to put your face and personality with that name on the piece of paper. Your resume will stand out, and isn't that what you want? But is there any inexpensive software title that will let you create such projects as cross-platform stand-alone executables? Destiny is a do-it-yourself multimedia presentation creation tool. It will walk you through the steps of choosing a background, choosing background music (or no music, or your own MP3), choosing the number and titles of your pages and how to format your text, and include photos and video. Your finished projects will need no additional software or plug-ins to function. Do a Google search for interactive resumes. Look at the cost. Think about having one made just for you ... then you move to a new address. Your contact info on the i-resume that you just spent $300 for are wrong. With Destiny, you can go back into the file and edit it as often as you wish, then make a Christmas card and a photo gallery of your last vacation, all on your lunch break. And you can get DESTINY for less than the cost of a tank of gas. The label art of every CD is stamped by hand. Each pattern is unique. As updates to the software become available, links will be provided here for free downloads. You will also need a CD burner and software capable of burning in the "Mac and PC" format, also called the ISO 9660 format. Destiny will run without this but you wont be able to distribute what you make. Using Destiny will NOT guarantee you a job! 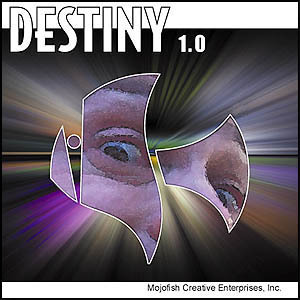 Mojofish Creative Enterprises, Inc. makes no claim that your use of Destiny will guarantee you get the job you want, or any form of employment whatsoever. At purchase, it is IMPORTANT that you provide the name you wish to use, this is the name that will appear in the software and your finished projects above your contact info. Contact info will be editable, the name is not. Provide the name as you wish it to be used, character for character, in the comments box at checkout from the virtual store. You can get this package for only $36. Imagine what you can do with this. Purchase yours today from our virtual store and write your own destiny. © 2008 - 2011, Mojofish Creative Enterprises, Inc.